16" Self Contained Floor Scrubber Details - Quasius Equipment, Inc.
Our Powr-Flite CAS-16 Automatic Scrubber is a complete floor cleaning system. It's 4 gallon solution tank and 4 gallon recovery tank make for a self-contained system and eliminates manual wetting and drying of floors. 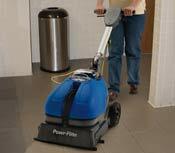 It's 16" wide brush lets you clean up to 12,500 square feet per hour while the powerful 1.5 HP vacuum motor removes all moisture, leaving you with a nice dry floor. 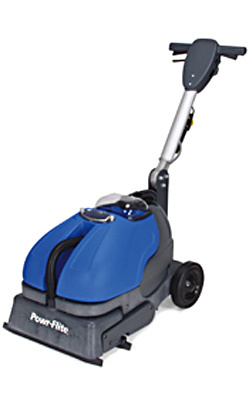 This unit is designed for any hard floor type and will greatly reduce your floor cleaning time compared to traditional scrubber or mop and bucket methods. The spring loaded scrub deck ensures consistent performance, even on uneven or tiled floors. It only weighs 55 lbs and the folding handle makes this unit a snap to transport.